Definitely an upgrade from my days at the Metrodome! On Saturday morning, we headed up to Minneapolis to catch our first live European futbol match! Manchester City was playing Olympiakos in the International Champions Cup at TCF Bank Stadium. As a U of M alumni, I had early access to tickets so we jumped on the opportunity! It was strange being back on campus after so many years (I’ll keep you guessing as to just how many) and the changes were a bit shocking. 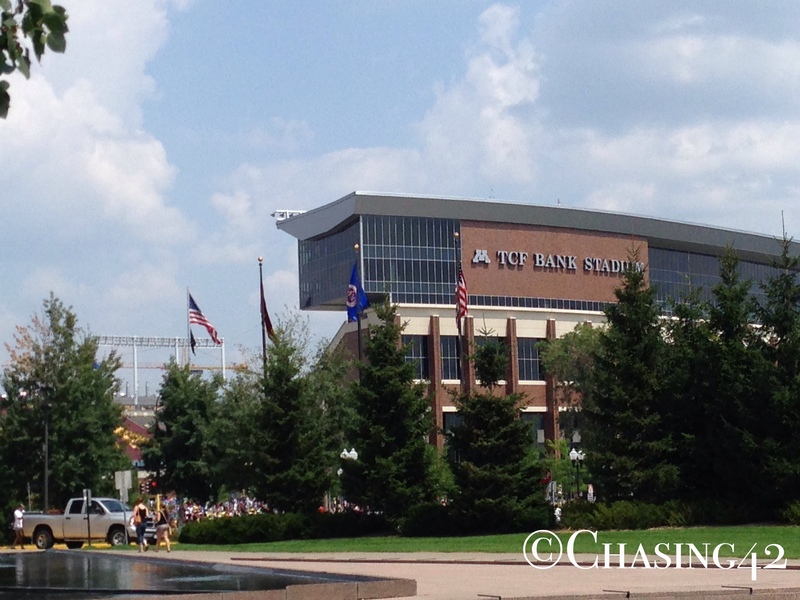 This was also my first time in TCF Bank stadium, which was truly exciting. It is a gorgeous outdoor stadium, and truly a stellar environment for U of M football, as well as a variety of other events. The stadium will be even busier this coming year, with the Vikings playing their home games there while their new stadium is being built. In some ways, it was a bit ironic that my first visit to the stadium was to watch a European futbol match, but I loved every minute of it. The sun was beating down on us, but it couldn’t have been a more beautiful day, and we were only a few rows back from the field. Both teams put on a fantastic show, and Olympiakos eventually won on penalty kicks after a 2-2 draw during regulation. It was an amazing experience, and a great way for both of us to ease the despair over the World Cup being over! I hope this match is the first of many! We stayed with my parents that evening, and then headed back early on Sunday morning. We needed to get back so we could pack and prepare for our yearly camping expedition up to the North Shore of Lake Superior. We look forward to this trip every year, and this year is especially exciting because we reserved a rustic, isolated hike-in campsite right on the shore with beautiful lake access. We stumbled across it last year while on a hike, and completely fell in love. Well, once we finished pulling out the camping gear and got most of our things organized, I packed up the items we wouldn’t be using and began to bring them back down to the basement. Then, as I was lifting a tub of gear, I felt a sharp and instantaneous pain in my lower back. I cringed in pain, and almost immediately was unable to stand. The epicurean rushed in and helped me to the living room, where I laid down on the floor with my legs in the air and felt wave after wave of pain rush over me. All of a sudden, horrible thoughts came rushing into my head. What about our camping trip? What about our hikes and my trail running plans? What about my race in September? I have a training schedule to stick with and my race is so close! The emotions were pretty strong and I felt horrible for potentially ruining our yearly camping trip. For the rest of the day, I laid on the couch, and dreaded having to get up for any reason. I would gingerly shuffle across the floor, and randomly collapse into the epicurean’s arms to support myself because my back pain wouldn’t allow me to stand. I haven’t had many injuries in my life, running or otherwise, but this was definitely the most intense pain I had felt in quite some time. On top of that, I realized very quickly just how critical this area of your body is to all normal functioning. You can still get around with an injured foot, arm, wrist, or knee, but your back really holds everything together (duh!). I tried to avoid the pity party and think about worst-case scenarios but my mind has a way of conjuring up some rather elaborate images and scenarios. It was bad enough that I wasn’t able to go for my Sunday run, but I was worried about running at all in the next few weeks, as well as stressing out about our camping trip. The rest of the evening was an exercise in minimalism. I focused on breathing, moving as little as possible, and being present in the moment so as not to send my thoughts into a tailspin. I slept on the couch that night since I clearly couldn’t make it up the stairs (better that than getting banished to the couch, eh? ), and slept very little. I woke up the next morning, and my back had relaxed some, and I was able to walk, although quite gingerly. I made an appointment to see the doctor and kept my fingers crossed that it wasn’t as bad as I had considered. In the lower back, it seems that it is typically one of three things. 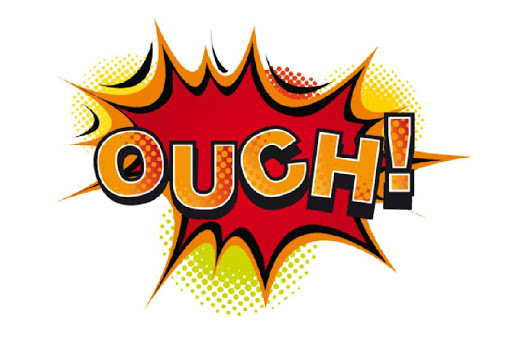 It could be a pinched nerve, a slipped or herniated disk, or a muscle pull/strain. I was hoping for the latter of the three, and my own self-diagnosis suggested a muscle strain as well. Luckily, the doctor confirmed my suspicions. He prescribed a month of physical therapy, as well as some muscle relaxants. Over the last 24 hours, I have steadily improved, and have been able to get around much easier, so my progress has been steady. I’m still committed to our North Shore adventure, so I’m hoping my body will agree with me! After today, it will have been 4 days of “rest”, or at least no running. This is the longest I have gone without running all year, and I’m certainly starting to get antsy. I’ve been saying for at least a month that I needed to scale back my training miles a bit, so perhaps this is the universe telling me to take it easy and not overwork myself. I’m hoping this period of mandatory rest will be just what I need to finish my training schedule strong and conquer the Mark Twain 100! What a bummer!! I’m sorry to hear of this and hope you heal up fast!! Thanks 🙂 Some solid PT should help immensely!